The hymn Ave Maris Stella (Hail Star of the Sea) printed below in English is a wonderful tribute, both in prayer and song, to the Blessed Virgin Mary. The original Latin text dates back to around the 8th- 9th centuries although it has been attributed to St. Bernard of Clairvaux (1090-1153). It was a particular favorite of those chanting it as part of the Divine Office (the Liturgy of the Hours) in the Middle Ages. It is important to remember that in our prayers to Mary we honor, not worship her. 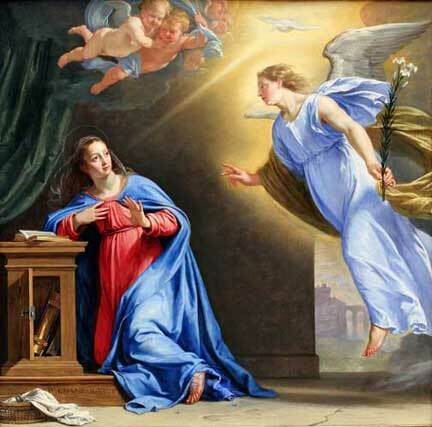 As we read above “May the Word Divine/Born for us thy Infant/Hear our prayers through thine.” She is more than happy to help us intercede to her Divine Son for the graces and mercy we need from Him. Note also in this reference in the Ave Maris Stella to Jesus as the “Word Divine”. Perhaps the original author was thinking of that wonderful reference to our Lord in St. John’s Gospel, which is also echoed in the Angelus, in which the Evangelist states that “the Word was made flesh, and dwelt among us” (John 1:14). There is a nice play on the words Ave and Eva in the second paragraph (“Ave” meaning “Hail”, and “Eva”, meaning “Eve”, in Latin). Eva refers to our first mother Eve, who tragically helped bring about humanity’s fall from Grace in Original Sin. The Ave Maris Stella can help those of you wishing to get closer to our Lord with the aid of Our Blessed Mother. After all, the great Saint Louis de Montfort, a renowned champion of Mary, made use of this hymn in his famous method of prayers and readings which we now know as “Total Consecration to Jesus through Mary”, described here. We definitely recommend Montfort’s approach as a great way to increase in holiness!